Divertiti con noi guardando un paio di minuti del Saggio 2018 “Rainbow” della maestra di danze mediorentale Caty! Tante coreografie, musiche coinvolgenti, solidarietà tra le donne e un po’ di culture del mondo arabo, tutto in una notte a Borgaro! Costumi rigorosamente di Caty Oriental Bazar. Caty e Andrea li hanno curati personalmente. 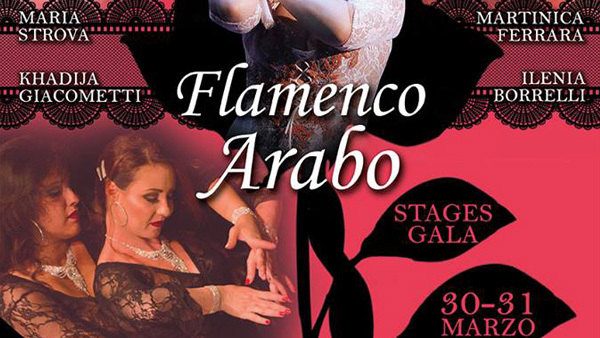 30 e 31 Marzo 2019, a Fiano Romano, ORIRI FESTIVAL – Flamenco Arabo – direzione Artistica Maria Strova e Martinica Strova Ferrara. Guarda questo video della bravissima Martinica Ferrara Strova che si esibisce in un pezzo di Flamenco Arabo con il ventaglio! Divertiamoci insieme guardando questa bellissima coreografia di un grande Maestro! Condividete e fateci sapere cosa ne pensate! Shaabi (Egyptian Arabic: شعبي‎ Shaʻbī pronounced [ˈʃæʕbi]) is an Egyptian musical genre. It is a form of popular working-class music which evolved from baladi in the second half of the 20th century. Shaabi means ‘of the people’. It originated in Cairo in the 1970s, as a new form of urban music expressing the difficulties and frustrations of modern Egyptian life.Shaabi lyrics can be both intensely political, and filled with humour and double entendre. Because of its nature as street music, and a widespread indifference to copyright law among Egyptians, Shaabi today is mainly distributed on pirated tapes and CDs. The first shaabi singer to rise to stardom was Ahmed Adaweyah, whose first album in 1972 sold a million copies. Like many shaabi singers, Adaweyah was famed for his mawwal. More recently, Shaaban Abdel Rahim rose to fame in 2000 with the controversial ‘Ana Bakra Israel’ (‘I hate Israel’), and has remained something of a working-class hero due to a string of populist political hits. Other well-known singers in the shaabi genre include Saad al-Soghayer, Amina, and Abdelbaset Hamouda. Another notable singer is Hakim, who is from a middle-class background unlike most shaabi singers, and whose commercially successful brand of shaabi-pop is generally cheerful and apolitical. La danza della Melaya, dalle donne di Alessandria d’Egitto. Scopriamo insieme qualcosa di più! Divertiamoci insieme con questo bellissimo video di una troupe egiziana!